Ponza, Pamarola, Zannone, the most beautiful pearls of the Mediterranean, a slice of heaven, every bay a different color of stones and crystal clear water. Shelter of people and yachts that escaping from the urban stress and everyday life. The residence Sunset Village Ponza, ideal place to live an unforgettable holiday, is perched on the rocky wall of the "Caletta" surrounding the bay of "Cala Feola" where the sound of the sea will keep you company accompanied by a breathtaking view with, on the horizon, the island of Palmarola where the sun hides every evening. The care that the owners have of the place is priceless. The area of Le Forna, where it is located, is the only on the island with beaches access on foot. Not far from the apartments is accessed on foot, to the "Caletta", the "Piscine Naturali" and the sandy beach of "Cala Feola".The area is served by grocery stores, bus stop and some restaurants. We would be happy to arrange excursions or give you informations where to rent boats or give you some advice on paths to explore on foot. We care that our customers are satisfied in all and they leave us with a smile. 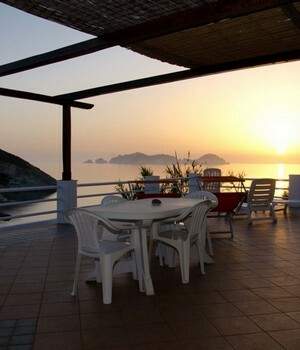 The most 'beautiful location on the island of Ponza. Do not you ever tire to enjoy the view on "Cala Feola". What is most striking and 'sunset, with the sun setting behind the island of Palmarola. Mrs. Ada and Gianluca, who run the hotel, are lovely people and extremely helpful. Only. 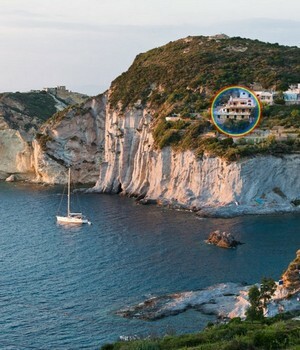 The island of Ponza was a surprise ... beautiful natural true! The position of village sunset is nothing short of breathtaking! You will enjoy relaxing on the terrace admiring the beautiful sunsets and hear the natural sound of the sea ...! Made us spend a lovely break out of our phrenic world of the city! The sunsetvillage is cozy, comfortable, clean and has a fabulous location !!! thanks for every moment spent in this paradise !!!! I rented this little corner of paradise one of their small apartments to spend our family vacations. The welcome was great, family, just like we do. Everything is impeccable and spotless. Just in front of the apartments we found a large terrace, oriented at sunset, where we had a lovely evening, having dinner immersed in this wonderful natural postcard. 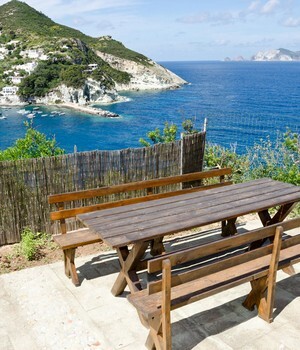 It 'hard to describe how fascinating Ponza and how you can enjoy from Cala Brigantina. We recommend because we were just fine. 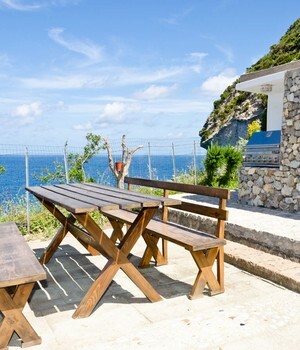 There is also a barbecue available and the famous natural pools are just nearby. If I will attach a photo to this my review, because the words are hard to describe the charm of the panorama I have had the privilege to admire.